Patrick Feetham (# 33 in the list of senior men to represent Great Britain) was born on 25th October 1950. By the time he was 15 he had joined the London based Southern Roller Speed Club and was already establishing himself as a prominent youngster. The first Junior British Championships had been initiated in 1961. It consisted of a single event, a Half Mile, and was only open to junior boys aged between 12 and 16. In 1966 the format was no different, and on 15th January that year it was a 15 year old Patrick Feetham who would get his name on the trophy, the Charles Julian Davis Cup. Turning senior in the October, at the start of the 1966-67 domestic season, Feetham found the jump from junior to senior initially quite difficult. (British skating seasons started on 1st October and ended on 30th September the following year right up until 2000 when it was changed so that the new season would start on 1st January). However, he continued to work hard and it soon became apparent that his strength was his strength. By 1968 he was starting to emerge once more as someone to watch if he happened to be in your heat. In the March he would win the Cricklewood Cup handicap event off 65 yards, but it was not until 1972 that he really started to get himself noticed by beating Fry and McGeough into second and third place respectively at Rye House. Also in the Southern club at that time was a skilful youngster by the name of Gerrard Bissett. Bissett was five years younger than Feetham but was showing greater promise, and was rewarded with a place in the British team for the 1973 European Championships in Grenoble, France, but not before having jumped ship and moved to the Midland club alongside John Fry and John Mullane. Despite his efforts Feetham was still being overlooked in favour of other skaters who were perhaps more "pleasing on the eye" in terms of technique and style. Undeterred he kept up his strict training regime and continued to try and break into a national team that was starting to re-establish itself after the retirement of the likes of John Folley and Bill Sharman. As well as Bissett in the early days, Feetham was lucky enough to have alongside him in the Southern club the likes of Eddie Bradbrook, Peter Howe and Bobby Smith to bring him on, not to mention the much valued experience and advice from world medallist Pat Barnett. In fact, collectively, the Southern senior men’s team would dominate the British Inter Club Relay Championships for a period of four years between 1973 and 1976. In June 1974 the British team was selected to take part in the European Championships in San Benedetto del Tronto, Italy. This time Feetham was not overlooked and along with Geoff Mattock he joined Fry, Mullane and McGeough at a major international. Just weeks after the team’s return, Feetham made everyone sit up and really take note. On July 13th he was again part of the winning team for the British Inter-Club Relay Championship and scored a well earned victory in the Southern Counties, just pipping Mick McGeough to the line. His domestic goal was reached just a few weeks after that by winning the 8000 metres (previously the Five Mile) British Championship at Tatem Park, London. It was his first individual Championship and his first individual Championship medal. 1975 would be the year he would really be seen as one of Britain's elite skaters. After all the hard work and effort Feetham had arrived and in May that year firmly established himself as the fourth member of a racing quartet that over the next five years would take on European and World Champions and be successful. There would be a number of skaters that came and went in the British team over the years - the likes of Mattock, Bissett, Smith, Bartlett, Downing, to name but a few - but Feetham was a stayer. Alongside Fry, Mullane and McGeough these four skaters were a force to be reckoned with. 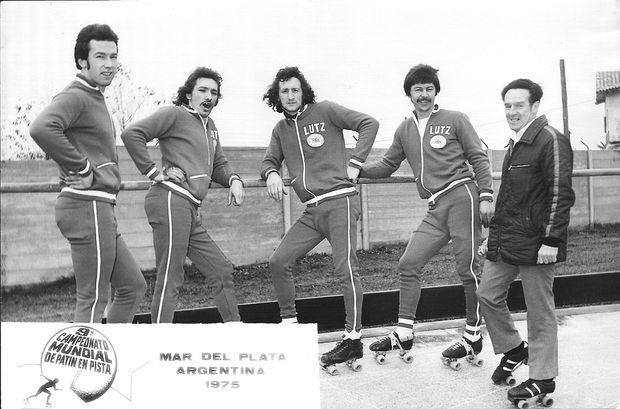 His first outing at a World Championships was in Mar del Plata, Argentina, in May 1975. The Championships were to be cut short due to bad weather and Feetham would only get to skate one event, the 1000 metres knock-out. In it Feetham took the bronze, ahead of New Zealand's Peter Maxwell. On his return home he again won a British Championship, the 500 metres on Tatem Park. He also went on to take bronze in the 1000 metres as well as another gold in the relay. The World Road Championships of 1975 were held in Sesto San Giovanni in Italy in September. Feetham, however, could not reproduce his form from earlier in the year, and although he skated in all five events, he would finish 13th on no fewer than four occasions and fail to finish in the 20000 metres. 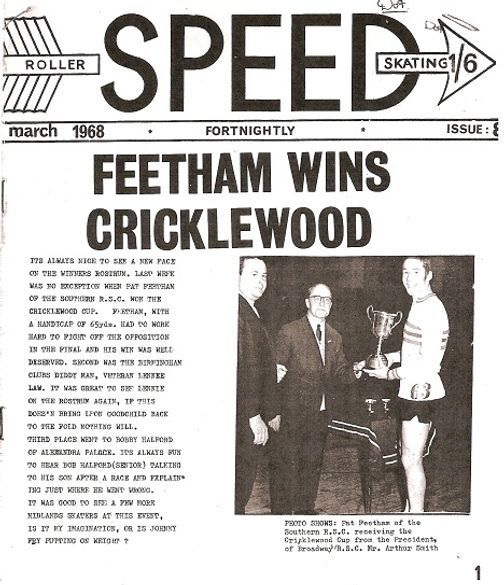 In 1976 Feetham was having to battle not only skaters from other clubs on the track but with some members of his own club, Southern, off the track. Their differences centred around training. For some years Feetham had trained the club but in 1976 he collectively wanted the team to step up a gear which meant he didn't want club members to train with other clubs and effectively help improve the opposition. Initially it was agreed but over time some members decided to ignore this directive. Feetham wasn't prepared to overlook this and duly resigned his position as club trainer and also made the point that whilst he would continue to race for Southern he would pick and choose his training sessions so as not to benefit skaters from other clubs. The club called an emergency meeting and decided that if Feetham was no longer prepared to train with them then he wasn't welcome to race for them and so ended Feetham's long standing association with Southern. 12 months earlier a number of skaters who lived outside of the city of Birmingham had asked to join the Midland club and it was generally felt that a “change was as good as a rest”, so a suggestion to change the club name was made. 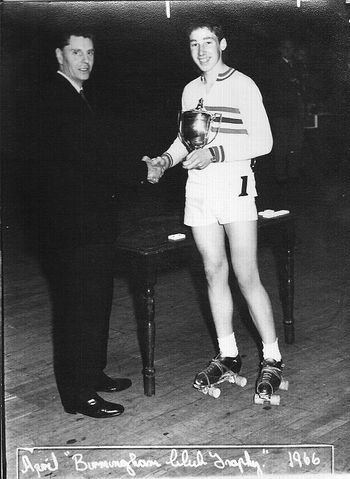 It was the skaters from Leicester, notably Geoff Mattock and Len Law, who suggested that the club name should reflect a region rather than a specific city (Mattock and Law having previously skated for the Birmingham Roller Speed Club, despite living in Leicester) and so the Mercia Roller Speed Club was born. At its nucleus was European Champion John Fry, along with British internationals John Mullane, Geoff Mattock and Gerrard Bissett (although Bissett would return to Southern for the 1976 season). There was also former World Record holder John Toy as well as former New Zealand national team manager, Cliff Stafford. In fact the club simply oozed class. As Feetham walked out of the meeting that saw him unceremoniously booted out of his own club, his long time friend and training partner, Gerrard Bissett, commented that now was possibly the time to join Mercia. Bissett had raced for Mercia (previously Midland) for a few years but had returned to Southern in 1976 to skate alongside Feetham. Due to recent events, however, his return was to be short lived. Feetham's (and Bissett's) inclusion into the Mercia fold was not straight forward. First there had to be a club vote. It is said that there was only one objection, John Mullane, but the majority agreed that Feetham should be allowed to join and in so doing it would prove to be yet another turning point in an already successful career for the Londoner. The 1976-77 season got underway on the 31st October with the Palace Trustees Cup. Feetham donned the Mercia club colours for the first time...and was duly disqualified. Despite that, no longer was he racing against Fry and Mullane but he was now one of them and with it came team work. Yes, the Southern club had been a good team collectively, but fell a little short when it came to helping each other take an individual win. The Mercia club, in contrast, now had all the guns in the arsenal. Fry and Mullane were naturally fast and Feetham was naturally strong. It was this strength, though, that gave Feetham his speed, especially on road circuits and big wide open tracks like Tatem Park. Feetham again made the British team in 1977 for the European Championships in Finale Emilia (road) and Salerno (track) and then again in 1978. The 1978 World Championships saw Feetham return to Mar del Plata, but this time he could only manage 8th as his highest placing. At the European Championships in La Roche-sur-Yon in the same year, Feetham travelled with the team but did not skate due to injury. Here it was Tom Bartlett who took Feetham's place in the team. It was to be an unfortunate circumstance for Feetham as the British team were on song. There were wins for Fry, McGeough and Mullane and had the team not been withdrawn in protest from the knock-outs, an almost certain medal for Bartlett with all four British skaters through to the last eight (Mullane had already made the last four in fact). Feetham would have to wait for his next opportunity, the 1979 European Championships in Ostende, and this time there were no disappointments. McGeough retained his 10000 metres title (McGrath taking silver in the same event), Fry would take bronze in the knock-outs (it was a race off between Fry and Feetham for 3rd and 4th with Feetham giving up the medal so they could both be fresh for the next event) and Fry going on to win the 5000 metres. Feetham would realise his dream by winning the 20000 metres. Feetham actually crossed the line in second place behind Italian De Persio. There was bad blood between these De Persio and fellow Italian, Cruciani, that had begun some 12 months earlier in Mar del Plata. This time the two Italians trading punches with each other on the final lap, resulting in their disqualification and a subsequent gold medal for Feetham. Britain, for the second year in succession, had a hatrick of European gold medals. Nobody cared about the circumstances, least of all Feetham. His victory was well deserved and he had already proven that he was a worthy Champion. To top it all he would also be part of the British team that took silver in the European Road Championships in Leuven, Belgium, just a few weeks later. "I think it was after the success of La Roche and Ostende but it may have been before, and I think it was Mick [McGeough]who suggested we all get together and try to pass on what we could about being at the top of our sport. I think this is how it happened...one of of us approached the committee (not me) telling them that we as the national team felt that the younger skaters that would eventually take up the baton for GB, would or could gain from having a day or weekend with us showing them videos of races, training with them, and talking about equipment, so they agreed. I think it was held at Granby Halls. We had an open day it was manic so many turned up. BUT it was a one off. After that Pat decided to offer his knowledge of training so he ran training weekends. This was for the top skaters in the land including the GB team and don’t forget he was in the team. (WELCOME TO PAT’S WORLD). We found muscles in places that were so alien (NOT FUNNY) he killed us. But what was sad is we had a guy who if used in the right way could have made a difference with the preparation of the teams going to contest international events. But it never eventuated. Like you said so far ahead of his time. This was the start of what is today squad training". By the time the World Championships in Como (road) and Finale Emilia (track) came around in September, Feetham's form had dipped a little. Then less than 12 months after his success in Ostende he was dropped from the British team that travelled to Spoleto, Italy for the 1980 European Championships in favour of Birmingham youngster, John Downing. Downing would prove that the decision was possibly the correct one as he achieved 2nd in the 5000 metres. Feetham, however, returned for the road Championships on Southampton in place of the controversially dropped John Mullane. Again, Feetham's individual performances would be fairly average in comparison to his past results with his highest placing being 10th in the knock-outs. He did help secure bronze for the team in the relay, but by now he was starting to ask himself some searching questions. Despite winning his fourth (and last) British title in the August of 1980, the 10000 metres at Southampton, just four weeks later on 21st September, Feetham skated his last domestic race, the Herne Bay road race. Having already been selected for the forthcoming World Championships in Masterton, New Zealand, Feetham took to the track for one last time in a British shirt in December 1980. He had come to the end of his journey with regards to competing, but a journey that had seen a skater with probably less natural ability than some of those around him, work hard and persevere and be rewarded as being recognised for a brief period in history as one of the World's top skaters. "...I did not select him at Zandvoorde for 'his' 5km (1981) as it was the last event and the referee had told me he would disqualify the whole British team if John (Mullane) picked up a ticket in the race which he was sure to do at that point as they (the judges) were well and truly after him. He never forgave me for it.....but as manager I could not take the chance!" Feetham was also a canny racer, both as an athlete and a manager and successful as both. Most of his teams came away with medals at European Championships and an occasional World medal. The 1984 European Championship relay win for Darren Cobley, Rohan Harlow and John E. Fry on the road in Vienna was just one highlight. In the 1985 European Championships in Cassano d'Adda on the road, there was a mix up in the laps in the mens relay. Recognising this, Feetham made sure that his "strongest" skater was on to finish. 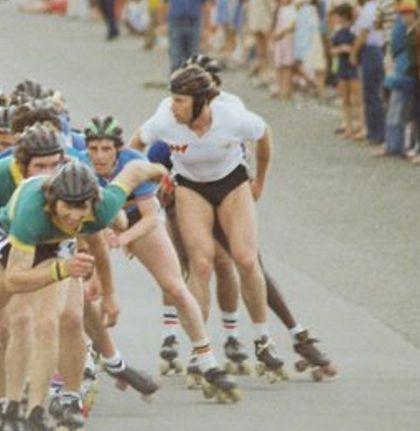 That skater was Ashley Harlow, and on the last lap he closed a gap of some 50 plus metres on 400 metre circuit to the leader at that time, Massimo Muzzi (Italy), and passed him down the finish straight to win for Great Britain. Muzzi had erroneously been left on for two laps. Unfortunately, the race was declared "void" because of the mix up in laps, yet Feetham (and many others) to this day believe that the real reason was that the Italians were embarassed to be beaten in such a manner on their home turf. Feetham's last outing as a team manager was the 1986 European Championships in Finale Emilia, Italy, where again Britain would come home with medals. In fact, every year Feetham was GB Team Manager the team came home from either a World or European Championships, sometimes both, with medals. He continued for another 5 years with the roller speed committee where he held the office of Chairman for a period of time and as Finance Officer secured sponsorship for individual skaters through the Sports Aid Foundation for the first time. 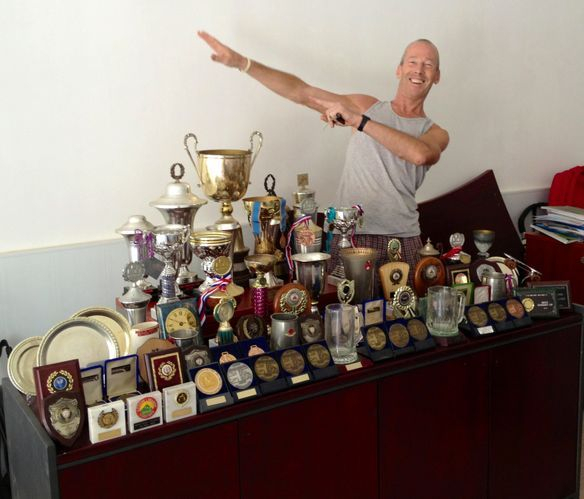 Since retiring completely from speed skating he moved abroad and became an accomplished tri-athlete winning medals and trophies at national and international level, just as he did with speed skating. It could be argued that he was (and still is) a fitness fanatic and possibly took it to the extreme on occasion, but what cannot be argued is that Patrick Feetham proved to all that natural speed and ability can at least be matched by absolute hard work and determination and the sheer desire to be successful.